Posh crisps can't sell themselves. Tyrrells is a remarkably successful brand. Founded 13 years ago by a Herefordshire potato farmer, the company has grown in leaps and bounds, sells crisps into 37 countries and made almost £50m of sales in the year to August. It’s achieved all that despite shunning traditional forms of advertising. Instead the firm has relied on word-of-mouth, PR campaigns, social media and what it calls ‘packvertising’ – the charmingly English designs on its brightly-coloured packets. But now it’s going in a different direction. Yesterday the brand launched its first ever ‘integrated advertising campaign’ in the form of more than 1,500 billboards in London and the south-east. According to the company’s delightfully on-brand marketing director, Jocelyn McNulty, the campaign is ‘a call to arms to say, "Any gathering with the right attitude and the right crisps can become an event".’ Okey doke. Those competitors are pretty fearsome. 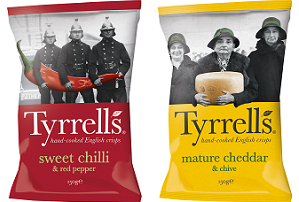 Since Tyrrells first launched, the market for premium crisps has exploded with the likes of Burts, Darling Spuds, Pipers and Salty Dog all vying for a slice of the pie. The change has forced industry heavyweight Walkers to up its game too, with the launch of its Market Deli range.